Finally got a corner sorted for the Pear Tree quilt. Now all I have to do is get the last borders done and finish the quilting. Shouldn't take too long, I wish. The weather isn't much today, but it's not a bad place to live. This is taken up near the headland looking down towards Oxley Beach. Here we have a little taste of the new quilt I have designed for next year. The colours are very rich and don't you just love the birds. 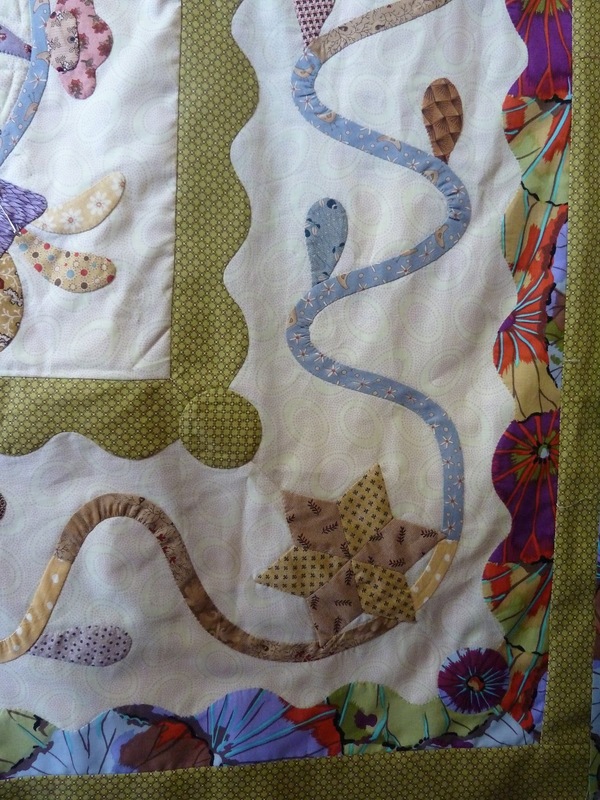 It is all free-hand or custom quilting and I use a Bernina. These are some photos I took while in Darwin. A young chap catching a ride. A gorgeous sunset off Mindel Beach in Darwin. A little corner of my lounge room with this gorgeous bird fabric for my curtains and a dirty butter colour on the walls. I also have quite a bit of red in the room as well. The top photo is showing a half view of the borders. The other photo is showing a portion. This is a very old piece of embroidery done on hessian. Maybe this was how the convict woman decorated the bags that carried their sewing stuff. We can never imagine the conditions or what these women had to endure, but it doesn't hurt to daydream on what might have been. I have been writing a story about our Maria quilt challenge and thought these tools might be similar to those used by the convict woman who came out to Australia on the ship 'Maria' in 1818. They also had 2lb of patchwork pieces to make their quilts. Our group of convicts who have taken up the challenge, set sail in February 2013. 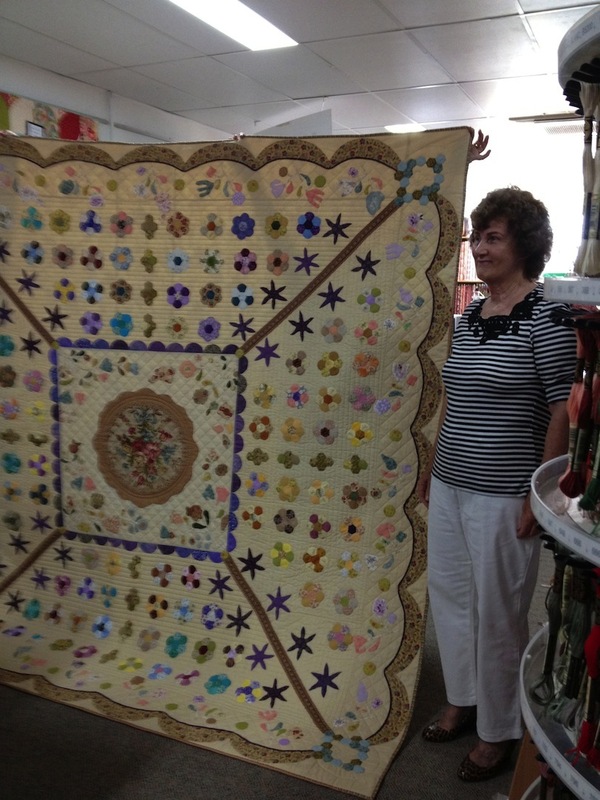 This is Margaret with her Cousin Wattle quilt finished and quilted. I have been reading a book called The Maria Quilt Challenge by Margaret A. Rowe. It is an intriguing story about a group of friends who sew together and about what happens in their lives as they tackle the challenge quilt. 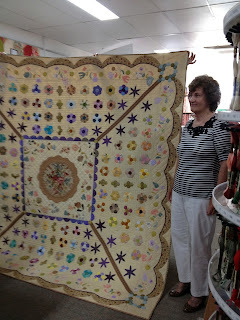 I also belong to a small group who get together and sew on a regular basis and we have also decided to take up the challenge and walk a little in the foot steps of our quilting ancestors. We will use the same supplies as the convict woman, 2lb of patchwork fabrics, thread, needles, pins, a tape measure and a pair of scissors. However we are not setting sail ( starting the challenge) till February 2013. We have decided to become convicts and share with each other how we came to be on the ship Maria in 1818. When we eventually land we will have a picnic and a big show and tell with our quilts. There maybe some photos along the way. Do have a read of Margaret's books and maybe get a group together and do the challenge. I am starting to get the hang of this, so am adding the top and bottom blocks to go with the others. This is the block below the centre. I have added the top and bottom blocks and will attempt to add a few pieces put together to give you an overall picture of what things are supposed to look like. This is the side block of which there are two. Now I just have to find time to finish quilting and get the borders done. I don't know what I do with my day. This is the corner block in my quilt The Pear Tree.